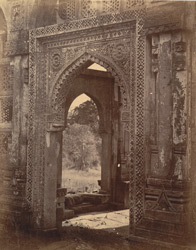 Photograph of door of the east porch to the Jami Masjid at Champaner, taken by Henry Cousens in the 1880s or 1890s. This image shows the rich carving on the porch doorway. In the Archaeological Survey of Western India, Vol. VI, James Burgess wrote, "The Jami Masjid or Public Mosque...is certainly one of the finest masjids in Gujarat...In the middle of the north and south ends were porches leading to doors in the court wall...on the east or front, the porch was of unusual magnificence. Now it is sadly ruined...It stood on a basement raised to the level of the court within, and was entered by doors on the north and south sides led up to by steps. On each side of these, and also over them were perforated stone windows. On the east was a projecting balcony - of which only the floor, supported by corbels, is left. Above were projecting eaves supported on brackets; the central area was covered with a brick dome raised on a moulded stone base, and at each corner was a small cupola supported on four pillars."